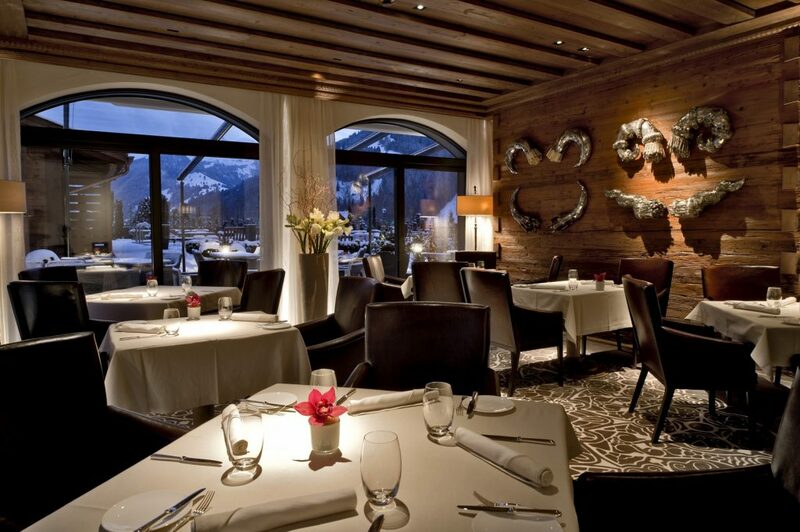 Nestled in the beautiful Alpina Gstaad hotel is the one Michelin star Restaurant Sommet. 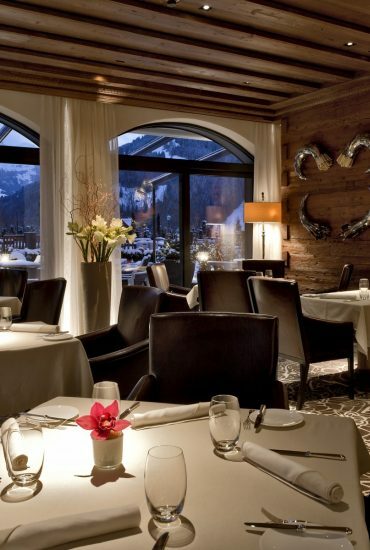 Created by renowned chef Martin Göschel this fine dining establishment deep in the Swiss Alps offers exceptional produce that will delight the most distinguished of palates, including Eisbär’s and mine. After a tough day skiing at Glacier 3000 followed by a much needed soak in our Love Suite by Kiki de Montparnasse we headed to the 1st Floor to taste what was on offer from this distinguished restaurant. Tip toeing across the floor in my Louboutin stilettos we were shown to our table by the vast glass windows and introduced to our waiter for the evening, Pasquale, who was from Calabria in the South of Italy. We started our evening with a glass of Louis Roederer champagne; well I am Champagne Charlie after all . . . followed by the Amuse Bouche. We were then shown our specially designed menus taken into account our allergies. Up first for starters was the tuna with pickled pumpkin, caramelized peanuts and edamame, the tuna was chunky and tender with a lovely clean taste and texture and with an overall acidy to the dish this was best paired with Shirabegura Sake. 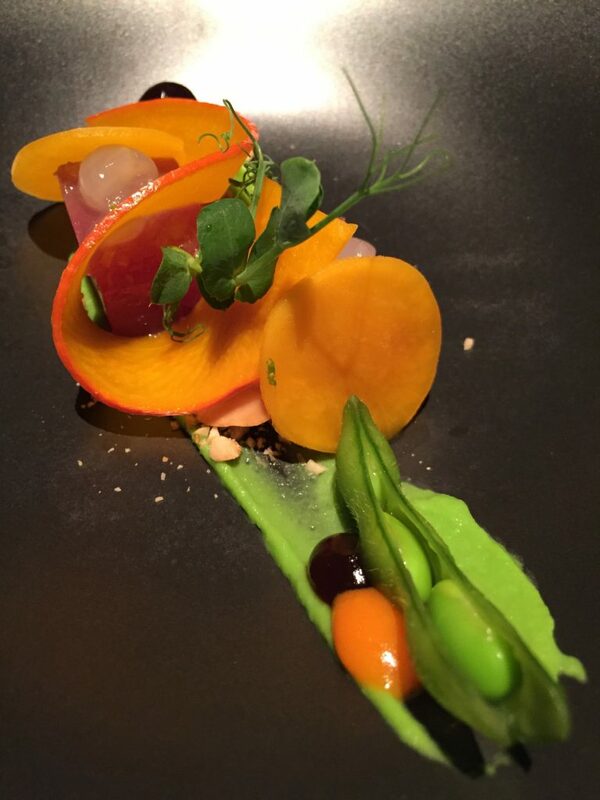 As the dish was served cold this was a wonderfully fresh way to start our tasting menu. This followed with a course of pike perch with duck liver and carrot and pumpkin purée, this was an unusual pairing, I have never before had fish with duck liver, but strangely it worked! The sauce was a vibrant orange colour making the dish rather attractive to the eyes and the fish was perfectly cooked so the skin was crisp. This was served with a 2013 Iselisberg Cuvee Blanc, made by the Lenz vineyards near Zurich, this wine is certified organic according to the guidelines of BioSuisse, Delinat and BCS Eco-Guarantee. Following this was the mild cured char fillet with garden radish and wasabi crumble; the char was served raw and cold with squid and caviar, this dish was also extremely pretty to look out with tones of pink from the radish and the squid. The most impressive part of this dish was the wasabi crumble which was created using carbon dioxide to instantly freeze the wasabi turning into a light fluffy meringue liked texture that was mild and delicious. 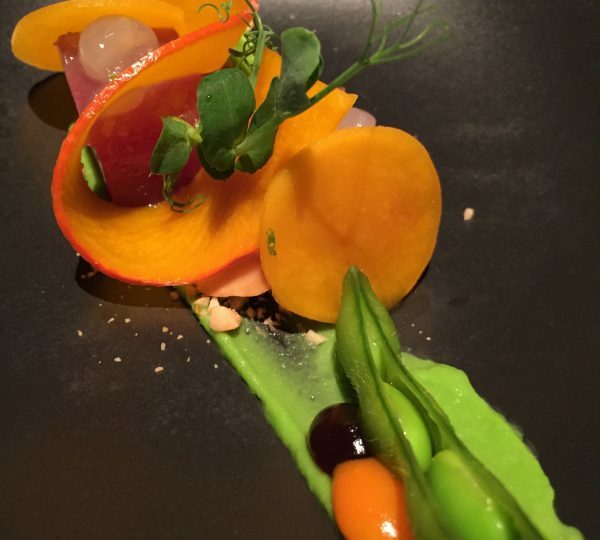 This was served with a 2014 Arvine Viogner from the Magnificients Vineyard; its bouquet is expressive, fruity and dominated by aromas of orchard fruit such as mature grape vines, grapefruit and mandarin, the prefect match for this dish. The main course was to be the Wagyu beef sirloin steak with red wine onions and polenta; the beef was served including the fillet and cheek with a meat jus, both perfectly pink and tender. 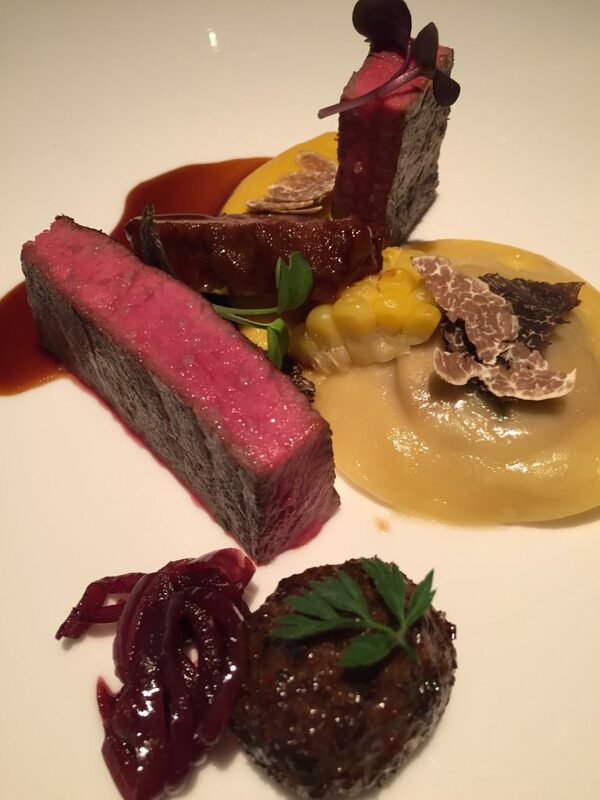 The dish was also served with gluten-free ravioli filled with the Wagyu and topped with both white and black truffles. I think this was my favourite course; the meat was perfectly cooked and melted in your mouth and the flavours combined to produce a truly exceptional dish. Pasquale paired this course with a Spainish red; La Montesa Rioja which is made up of 45% Tempranillo, 40% Garnacha and 15% shared between Graciano and Mazuelo; all aged in French oak for 14 months. This is a rich and generous wine, with notes of hedgerow, blackberries, ses. With the beef being a meaty opponent this wine stood its ground and became the perfect accompaniment to this course. Up next was the obligatory cheese course; never one to shy away from tasting local cheeses our entire cheeseboard was made up of Swiss cheese. Amongst them; Appenzeher, Gruyere, Goats Emmental, truffled Brie and a local aged Gstaad cheese. I think my favourite was the truffled Brie but then I am somewhat of a truffle fiend! 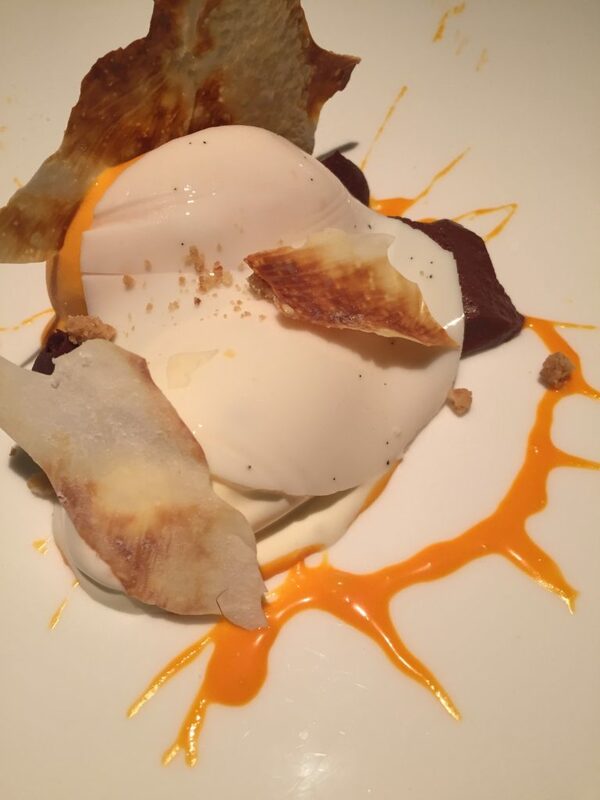 We finished the dinner with the desert of sallow thorn sorbet with mild chilli chocolate and milk textures. 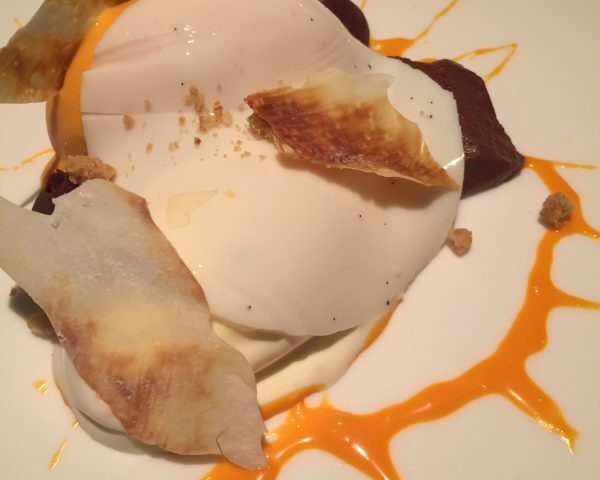 A rather visual dish that represented somewhat of a splat on a plate; however the sallow thorn sorbet, which was sharp, contrasted perfectly with the rich deep spicy dark chocolate and the creaminess of the milk textures. Rather charmed and contented by the meal we headed back to the dark seclusion of The Love Suite by Kiki de Montparnasse. 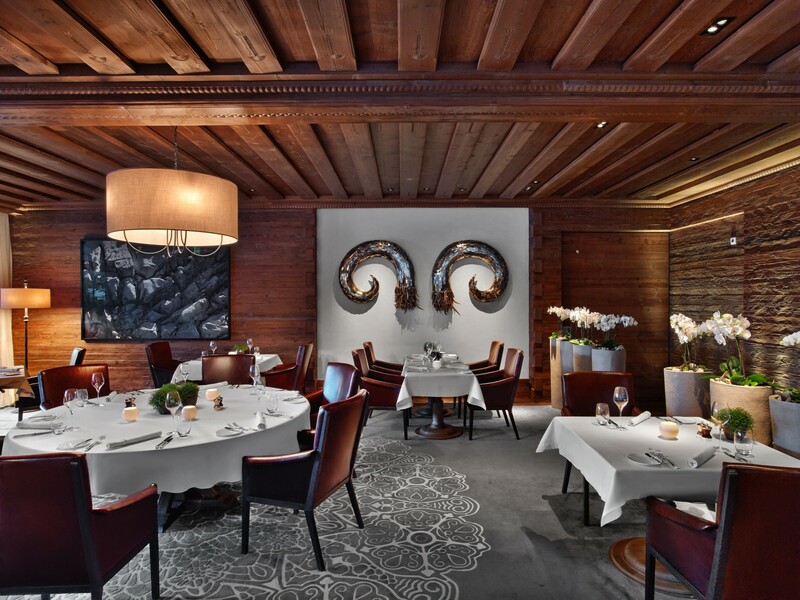 Restaurant Sommet perfectly showcases the extraordinary talent and an audacity that defies description from chef Martin Göschel and his team. 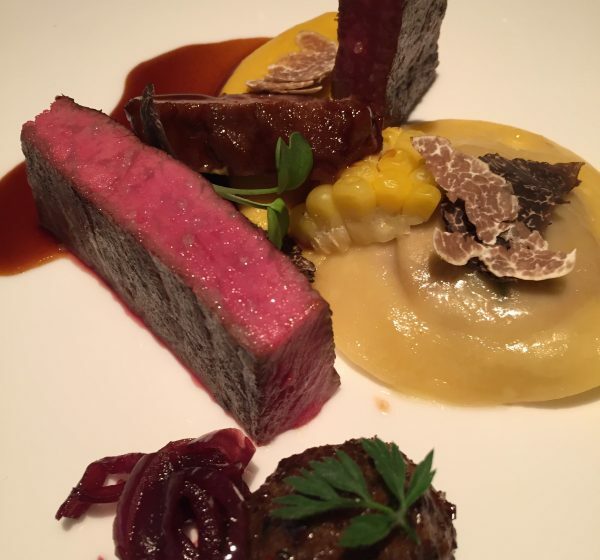 With his attention to detail and consummate precision, Martin Göschel’s sublimely creative dishes include steaks that are already considered the best in the region. 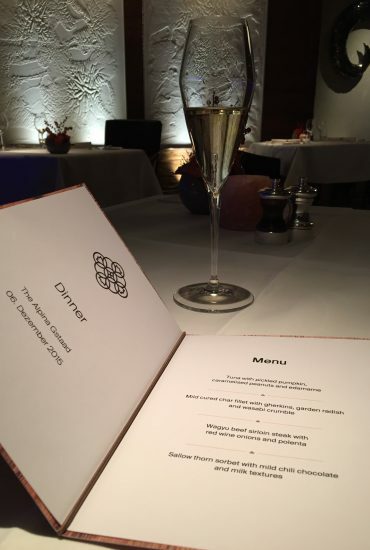 The unique tasting menu compiled by the Michelin-starred chef is also a real tribute to exceptional local produce and will delight the most distinguished of palates. From the cuisine to the impeccably tasteful interior design, the restaurant is the very essence of sophistication and promises an outstanding experience in every respect. So whether you are working up an appetite to take back to you Love Suite or just after a truly exploratory menu then the only address in Gstaad is at The Alpina!